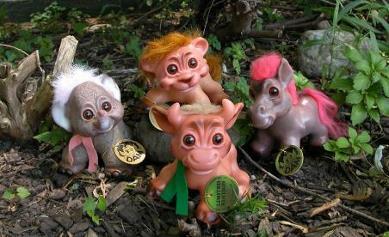 A LIMITED EDITION group of troll animals were also offered for sale by the Norfin Fan club (a total of 400 pieces each of– cow, elephant, lion and horse). Per the advertisement, these replicas were made from Thomas DAM’s original 1965 animal series. While there are definitely vintage cows, elephants and lions that were made in the 1960’s, I confess that none of the DAM collectors I know of, has ever had (or seen) a vintage DAM horse that was made in the 1960’s other than the large donkey which has a different body & facial sculpting. In the 1990’s the DAM company manufactured a LIMITED EDITION group of troll dolls and troll animals, as requested by E.F.S. Marketing Associates (an officially authorized DAM distributer located in Farmingdale, NY) these LE’s were geared for sale to the Norfin FAN Club members. These limited editions came with gold paper tags that had the DAM logo on one side and LIMITED EDITION on the other side. The original advertisement states that the Norfin club- had only 500 pieces of each (boy & girl) and were offering them to fan club members before they offered them to anyone else (eg– collectible doll stores & other specialty stores) for $50 each. A limit of 2 pcs was allowed per order with no choice in hair color or style. Also offered were some of the animals which were limited to 400 pcs of each style. The LE’s were advertised as being exact replicas of those trolls made by DAM in the mid– 1960’s. Many collectors incorrectly assumed that only 500 pcs were made, but the advertisement doesn’t really say this (see scan of original advgertisement at bottom of this page). The Norfin club was offering these trolls and simply HAD that quantity to re-sell AT that time. The true number of these LE trolls made by DAM is unknown and could be much higher than previously thought, or could possibly be limited quantities of all the different styles or variations within the series. It has come to my attention that some of these trolls were produced BEFORE being marketed by E.F.S. Marketing company as “limited edition” only the LE’s sold with the GOLD TAG are TRUE LE’s——unfortunately these tags could be easily lost. 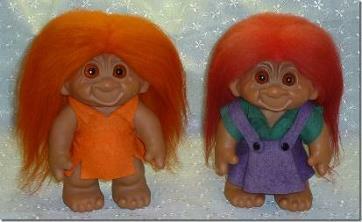 The DAM boy & girl troll doll came in different versions. Even though the original ad states that the dolls are replicas of the 1965 version in all details, we know that there were two body versions produced in this series- one with arms out (the traditional pose) and one with arms down. It should be noted that vintage 1960’s DAM troll dolls were not sold with an arms down body style. The arms out bodies are exact replicas of the 1961 Lyketrold body (not 1965 as the ad states). 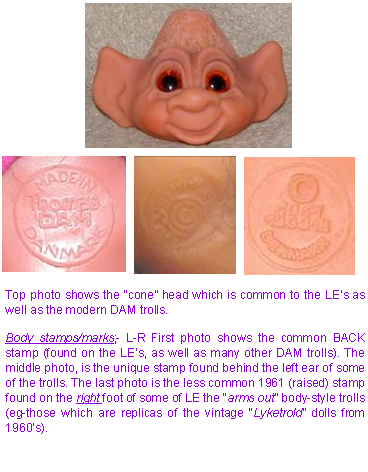 Another difference is that the LE’s have “cone” shaped heads (see photo below of bald LE), the vintage DAM trolls from the 1960’s had “flat” surfaced heads (where the wool pelt is attached). Some less commonly found LE’s (arms out version only), do have the 1961 stamp on the bottom of the foot (see photos for examples). LE trolls have the Thomas DAM logo on their back… but the logo by itself does not distinguish a troll as an LE, because the same back stamp can be found on many other DAM Trolls. To make matters more complex: some of the girls had non-removable jumper-dress with thong and shirt, others had a two-piece removable felt jumper-dress with shirt, while other girls had only a simple felt dress which was glued at the back. Boys came with non-removable shorts with a strap and a shirt with either short or long hair. Most of the LE girls and boys had real Icelandic wool hair but there were others which had the synthetic hair. Some LE trolls have the orange-yellow glass eyes and others have the brown, dark yellow or dark orange plastic eyes. Both LE boys and girls stand about 9” high and only their heads are moveable. Boys have the pointy ears and girls have rounded ears. 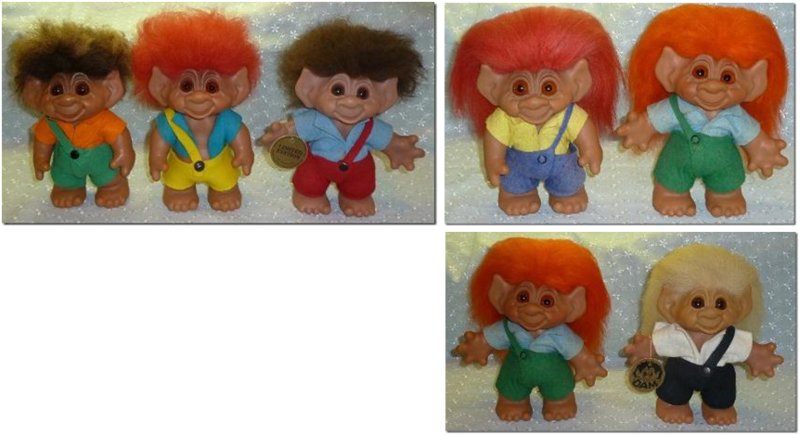 Limited Edition BOY Trolls- shown are several examples of the LE boys. Notice that they came with both short (cropped) or long hair. They can be found with arms outward (like the 1961 Lyketrold version) as well as arms down and at the sides. The picture at the lower right shows two boys with the arms out, but notice how the left arm on the one boy drops lower than his brother, this picture also shows a good example of how one has (amber) glass eyes, while the other has the (brown) plastic eyes. Boy trolls always have the large pointy ears. While they are consistent in having felt shirts and pants, the straps can be either over the left or right shoulder. Also worthy to note is some of these had a brown air-brushing above their eyes (see above photo of boys with short hair and arms down). 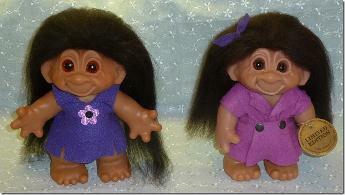 Limited Edition GIRL Trolls- shown are several examples of the LE girls. Girls had long hair. Like the boys, they came with arms outward (like the 1961 Lyketrold version) as well as arms down and at the sides. They can be found with glass eyes, or plastic eyes. Girl trolls always have the smaller more rounded ears. Dresses were either a plain felt one-piece dresses (which was glued in the back), a non-removable jumper-shirt (with thong) and open shirt or a simple removable jumper-skirt (no thong) with open shirt combination. Even though they are NOT as limited as originally thought. The LE boys & girls are great finds for DAM collectors. They re-sell on the secondary market for anywhere from $75 and up depending on the condition they are in and if they still have their original hair, clothing and the elusive gold paper LE tags. It should also be mentioned that some of the arms down LE’s usually have a white sticker on their foot that says “MADE IN DENMARK” . Without the signature GOLD TAG, it is very hard to prove a troll IS one of the LE’s. Tags can get lost. Many DAM troll collectors assume that the LE idea came from the DAM company and there are even “rumors” that there was an European version of the LE’s produced, however, I contacted the DAM factory and was informed by their CEO that the LE idea was implemented by the E.F.S. Marketing Associates Inc (even the gold tag shows the year 1990 and says it is “distributed” by the E.F.S Marketing Assoc. Inc). There is no “European LE” version. Scan of the original advertisement from E.F.S. Marketing Associates and the order form that appeared in their SUMMER 1991 Norfin News letter sent to fan club members is shown below. 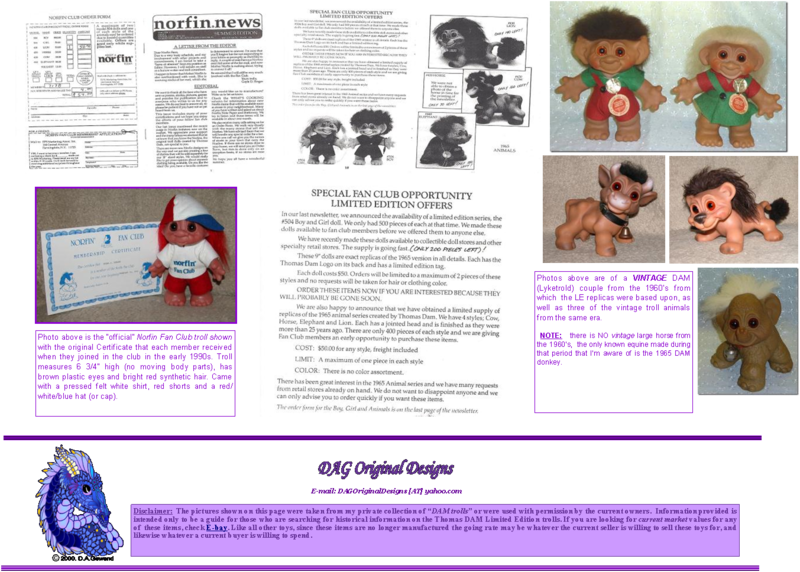 At the time the newsletter was printed pictures of the Limited Edition replicas were not available and so they used pictures of the actual “vintage” trolls (from 1960’s with genuine mohair) as samples. Although the sample pictures in the advertisement show a leather collar & bell on the cow and elephant, the actual LE replicas came with a FELT scarf. Many members/collectors thought that the “replicas” would be just like the vintage trolls and be faithful reproductions complete with the genuine Icelandic wool hair and glass eyes, it was a little disappointing for many who received the replica trolls which had the fake hair and plastic eyes. 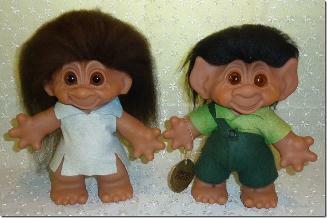 The order form allowed club members to order a maximum of TWO of the model 504 Troll (boy or girl) and only ONE of each style of the troll animals at $50.00 each, due to the limited quantities. Offer was only good while supplies lasted. Specialty toy stores charged higher prices on these LE’s (around $59.99 each, plus shipping charges). Group photo of all the Limited Edition DAM troll animals. These LE animals are prized by many DAM collectors and can re-sell for anywhere from $75 and up on the secondary market. The horse usually goes for a much higher price (four to sometimes seven times higher) than the other LE troll animals. Final fetching $$$ on any of these LE’s depends not only on the condition, but if the troll comes with all the original accessories (especially the GOLD LE tag) and how much a buyer is willing to pay for the troll. If you’re not sure if your LE’s have glass or plastic eyes, it’s easy enough to twist head off and then put it back on. Photo on top row show outside view of eyes. Bottom shows eyes inside the head: far left is troll with the orange-yellow GLASS eyes, middle photo shows the brown PLASTIC eyes and the last photos show the dark yellow & orange PLASTIC eyes. Notice the pupils on the glass eyes appear slightly smaller than those with the plastic eyes. EAR Stamp Debate—Many collectors thought that the “EAR stamp” was a unique stamp which did not appear on any other Dam Trolls except the LE’s (they all have it – even the trolls with synthetic hair) – it is a circular stamp located behind the left ear, at the base of the ear (see stamp photo at the left, it says © DAM THINGS Denmark). Many collectors thought if a troll does not have this stamp, then it is probably not an LE. A few trolls that look-like the LE’s have surfaced occasionally without the ear stamp, it’s hard to say if these oddities were truly a part of the LE series or not. Shown at the left is a photo of a boy and girl with NO ear stamp, yet they wear the same clothing as other LE’s with the ear stamp. Both were obtained on the secondary market, so it is really hard to verify if they were purchased from the Norfin Fan club with the gold LE tag (as shown on the boy’s wrist in the photo at the left). It’s possible that the gold paper tag could’ve been put on him at a later date, as the gold tags on all LE’s (troll dolls and animals) were identical and easily interchangeable. Unfortunately only the E.F.S. company or possibly someone from the DAM factory when these trolls were made would be able to clear this mystery up. I have made an attempt to contact the DAM company and was informed that I needed to contact the owner of the EFS company for further information to the questions I had regarding these LE’s. I then attempted to make contact with the former owner of the E.F.S Company (Eva and Steven Stark of New Jersey, USA) but I have had no success in receiving any correspondence back from either. DAM Hobby Horse Head– Photos above obtained from the DAM website shows a rare hobby horse head sold only in Denmark that was made in the 1970’s. Sculpting similarities on this head match the LE Horses shows above.